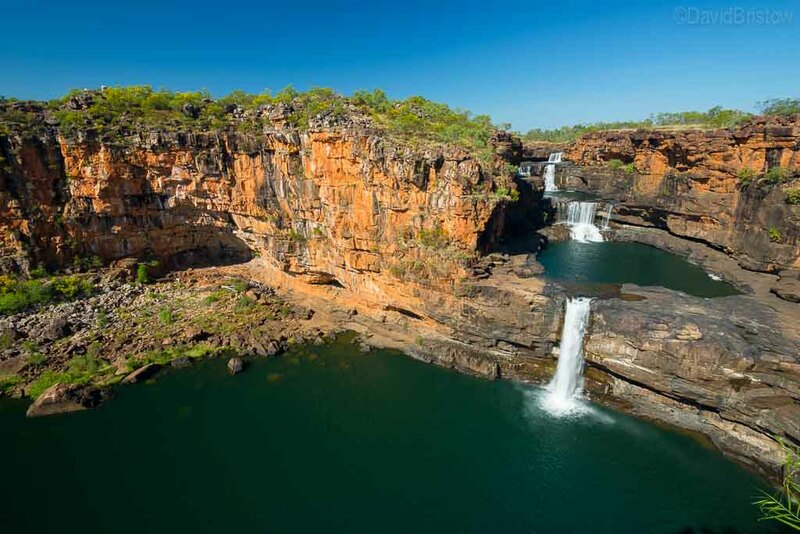 With plans afoot to develop Australia’s biggest national park in the northwest Kimberley, there is no time like right now to discover King Edward River’s remarkable Indigenous rock art galleries and take a hike to Mitchell Falls without the crowds. When resource giants Rio Tinto and Alcoa relinquished their mining rights on the Mitchell Plateau back in March 2015, tentative borders were etched on a map around a massive five million hectare slice of the Kimberley and it’s pristine coastal waters, but the process of negotiating with Indigenous land owners and developing park infrastructure may be years away. So far plans indicate that this new wilderness zone will incorporate the existing Prince Regent, Mitchell River and Lawley River National Parks plus lands to the north and south, girthed by new marine parks that will wrap around the coastline from Wyndham west to Horizontal Falls. a remarkable feat considering his pro-resources support for Woodside Petroleum’s failed and controversial bid to construct a gas processing plant on the coast north of Broome. The gas project faced enormous opposition from conservation-minded Australians and was ultimately abandoned in late 2013. Due to its remote location and extremely limited visitor access, the Mitchell Plateau is considered one of the most species-rich areas in Western Australia, harbouring 43 native mammals including the monjon, Australia’s smallest rock wallaby which was first photographed as recently as 1985. Fauna species threatened elsewhere in Australia are found on the Mitchell Plateau too where 280-year-old forests of livistona eastonii fan palms flourish alongside the track to the falls. A recent survey in neighbouring Prince Regent National Park discovered growing populations of northern quolls, golden-backed tree rats and golden bandicoots, and recorded the first sighting of a Kimberley sugar glider. Whether the new national park ends up facilitating greater access for visitors or more appropriately, greater protection for wild things and the innumerable sacred Indigenous art and burial sites across the region, remains to be seen. Lets hope there is plenty of involvement from the region’s traditional owners – the Dambimangari, Wunambal Gaambera and Wilinggin peoples – in determining access to their sacred lands, and opportunities for them to benefit from the nature-based tourism ventures that will most definitely come. Today, access to the Mitchell Plateau is via the Gibb River and Kalumburu Roads and is restricted to high clearance off-road vehicles during the dry season only (usually April to November). Please let any tourism in this area is thoughtfully managed. We cannot get this wrong. What a wonderful future this land has for future Australians.